It was a perfect sunny day with a gentle breeze blowing off the ocean. The half-mile path sloping downward was nearly empty. That didn’t surprise me because I was in a part of California few people travel to in relation to the popular urban spots. I was exploring California’s North Coast, an area that still feels like a bit of a secret. I looked up and could see the white tower and red roof of the lighthouse in the distance. It sat perched out on the edge with powerful waves spraying up against the cliffs. I slowed down and took the whole scene in. It was an iconic coastal lighthouse on the perfect blue-sky day with no one around. I was experiencing that familiar moment in travel where our expectations are exceeded, leading to a feeling of elation; the stuff travel addiction is made of. The day prior I visited other lighthouses on the coast that were just as beautiful. Before this trip, I never considered California to be a lighthouse destination. In fact, when I think of lighthouses, I think of Maine and the Canada Maritimes; but for some reason I overlooked California. As I looked at the Point Cabrillo lighthouse I felt pleasantly surprised as if I was discovering something new and unexpected. And that’s the best feeling you can have in travel, to feel as if you discovered something. Adventure doesn’t always have to mean a sweat-filled challenge, it can be as simple as this feeling I had now; the feeling of discovery. "This is like California 50 years ago. No traffic. No crowds. Untouched and undeveloped coast, sleepy little towns like Trinidad is where Californians vacation because it reminds them of old California,” remarked Richard who happened to be showing me around Trinidad’s little memorial lighthouse. I love it when places surprise me with something unexpected. 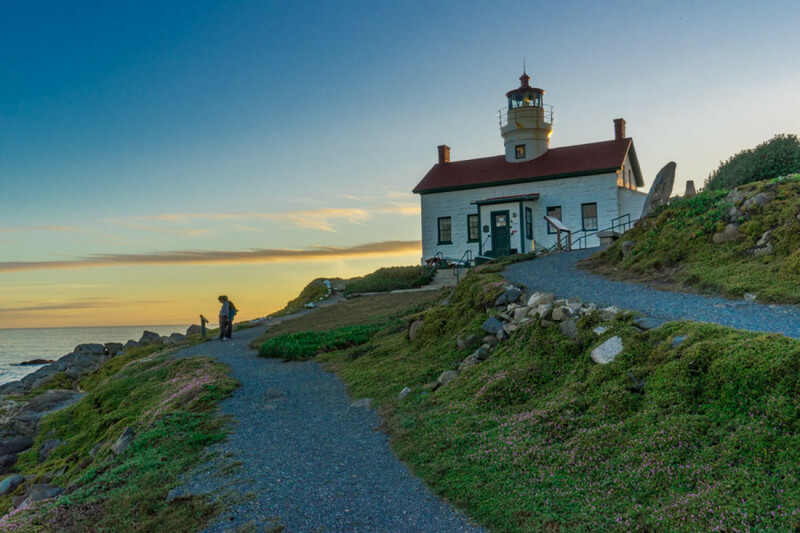 The North Coast of California is not only home to all the great hidden beaches and water adventures you would expect from the California coast, but it is also a mecca for lighthouses. And I was determined to see as many as I could in my short 2 days. There were 35 lighthouses/stations built in California. Some of them were tall to provide protection from the rocky coastline, and some of them were short and stout so they could be seen through the frequent coastal fog. The one thing they all had in common was their function: to protect ships from crashing into the coast or rocks. Like the famous California Missions, the lighthouses fell into disrepair due to costs. Global Positioning System (GPS) made the need for lighthouse beams nearly obsolete. However, up and down the coast of California the run-down structures are being saved and transformed into icons so that people can climb into history, and learn about the California coast. Almost thirty lighthouses still stand on the California coast. Sixteen of them are open to the public. On my trip, I visited 3 of them; each beautiful and full of history and tales of the dangerous seas, tough living, and changing technology. I got out of the car at the viewpoint and heard the crashing waves beat up against rocks and jagged shoreline. 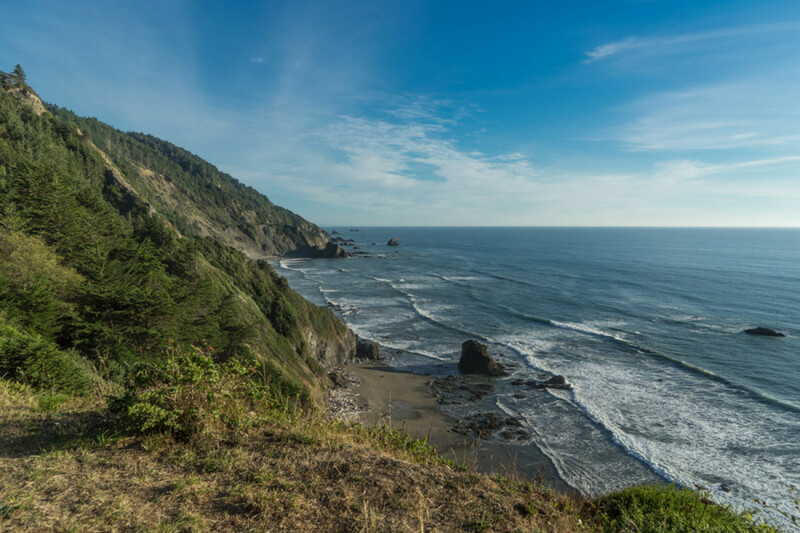 I stared out over the vast bay in Crescent City where big boulders poked out of the water as if they had just broken off from the cliff and tumbled into the ocean. This was my introduction to the wild, rugged North Coast, a side of California people seldom see. After visiting the Crescent Beach overlook, I knew my next hour would be a race against the clock. I looked at the setting sun and knew I only had a short time to get from this viewpoint to the Battery Point Lighthouse. Timing is everything when it comes to Battery Point Light. The lighthouse sits on a little rocky outcrop that is only accessible during low tide. Luckily the day I visited, low tide coincided with sunset. In the pink glow of the setting sun, I gingerly crossed over the jagged tide pools and reached the stairs leading to the little historic lighthouse. The lighthouse was erected in 1856 to protect ships from those giant boulders I was staring at earlier. It’s a hearty structure having survived the tidal wave of 1964 that flooded the entire peninsula as well as numerous earthquakes. In 1879, a massive wave knocked down the kitchen wall and knocked over a lighted stove. The house would have burned down if it weren't for a second wave that put out the fire! The 45-foot tower still functions today and you can go inside and see the light keeper’s quarters as well as the fourth order Fresnel lens on display. I spent all of my precious sunset time sitting outside on a bench watching the whole bay turn a soft pink as the sun disappeared into the Pacific. This was my introduction to Northern California lighthouse hopping. I pulled into the parking lot and looked around wondering if I was in the right place. There were a few other cars parked, but I didn’t see any lighthouse as I scanned the landscape. In fact, I didn’t even see any water! I finally noticed the trail sign that indicated the way to the lighthouse. Unlike the other lighthouses I visited, Point Cabrillo was only accessible on foot via a gentle downhill walk through trees that soon opened up onto prairie grasslands. Because it was fall, the grasslands were golden and blowing like a big wave in the wind. Occasionally, a little pop of pink color revealed itself since the Belladonna Lilly was in full bloom. I walked down trail and soon came to the restored lightkeeper houses and sheds. 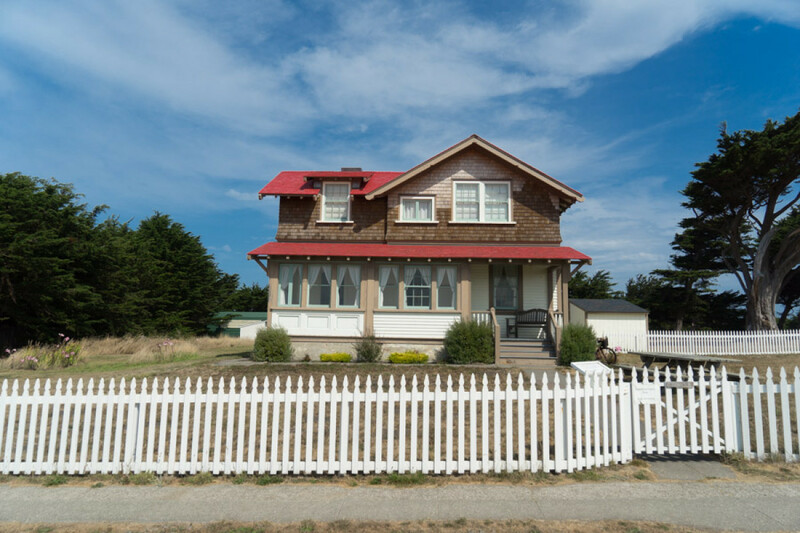 The restoration was gorgeous with a little white picket fence that went around the perimeters of the homes. I stood and stared at the beautiful homes thinking how picture-perfect they were. Even though I know being a lightkeeper is a hard life, the perks are that a home comes with the job; a beautiful one if you were the Point Cabrillo Lightkeeper! 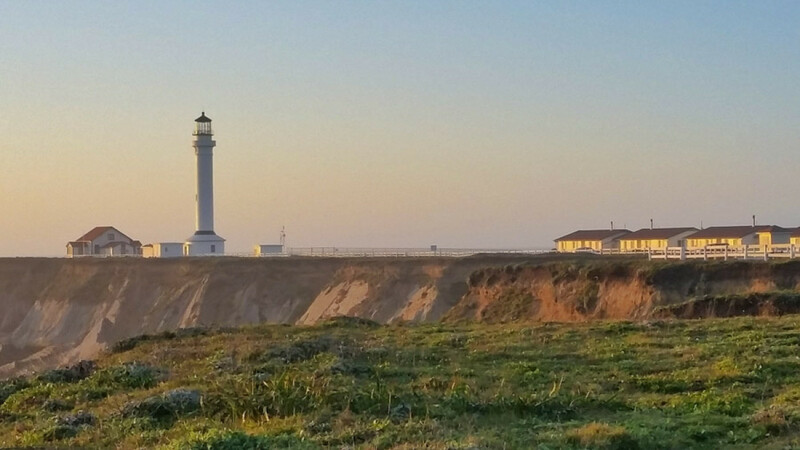 The Point Cabrillo Lighthouse opened in 1909 after Redwood forests were discovered and lumber mining began. The Mendocino coast became a shipping channel for lumber boats and many met their demise due to the rocky, foggy, and tumultuous coastline. The octagonal wood tower lighthouse was erected with a third order Fresnel lens and lightkeepers were hired to keep watch. The Fresnel lens has been restored and is still working today! I walked into the lighthouse giftshop and talked to the volunteer manning the shop. She told me all about the lightkeeper homes which are now rented out overnight as lodging. However, one of the homes has been restored to its original 1930’s design as a museum. She also told me the story of the locals who fought to restore the lighthouse, and eventually had it turned into a California State Historic Park. I looked at all of the pictures and exhibits around the lighthouse and hiked the coastline before heading back. The thing that surprised me the most out of the visit was that the whole park was nearly empty. A few people came and went, but this beautiful, serene setting that in other parts of California (or in other states) would normally be packed with visitors, felt more like a secret. I drove out the narrow road leading to the Point Arena Light House, the best-known lighthouse of the North Coast. However, there were only 2 other cars parked in the lot. I smiled as I knew I would have the area to myself again. This wasn’t just a lighthouse and museum, nearby lies the Stornetta Public Lands. It’s the first mainland-based unit of the California Coastal National Monument, and it’s a place I was looking forward to exploring. I arrived in the early afternoon and did a hike around the Stornetta Public Lands with Margaret Lindgren, owner of Unbeaten Path Tours. As Margaret filled me with facts, history, and biodiversity knowledge of the area, I was overwhelmed with her passion and ability to transfer that excitement to others. It reminded me that no matter how beautiful a place is, it’s often the people that make the place memorable. As I bid goodbye to Margaret, I looked at my watch and knew once again, timing was everything. We ended our hike at the Point Arena Light House just before sunset. 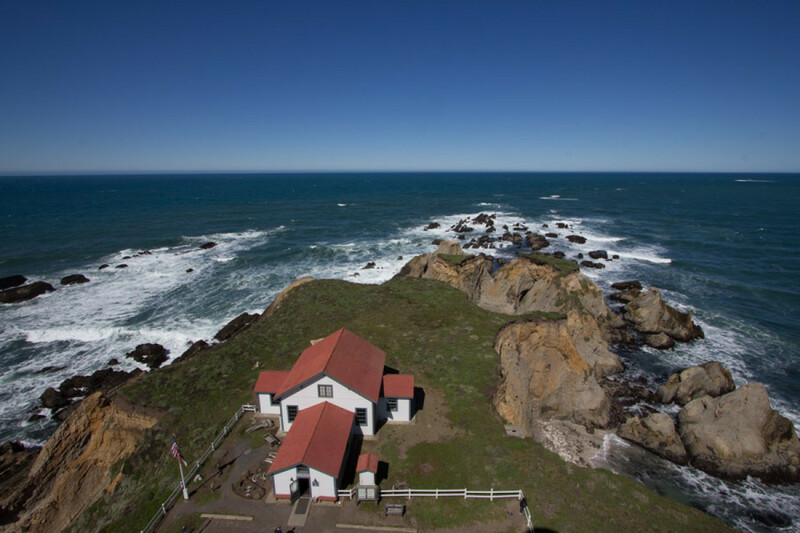 This lighthouse was different than the others along the North Coast; it stands 115 feet tall, towering over the Stornetta Public Lands providing some of the best views you’ll ever get of this part of California. Erected in 1870, the tower contained a first order rotating Fresnel lens, which is still on display in the lighthouse museum. The lens is more than six feet across and its 666 hand-ground glass prisms weigh more than 6 tons. It’s incredible to see the size and design of such a lens, and to compare how technology has advanced to produce powerful lights the size of a soup can.. I walked the 145 stairs to the top of the tower with a volunteer, Isaac, who told me all about the history of the area and the structure. Growing up as part of the Pomo tribe, he also provided a unique Native American perspective of the lands here that needs to be heard. Once again this lighthouse was being held together by an avid group of local volunteers who get funding for restorations and ensure the history of this dangerous coast is shared. Most people don’t think of California as a lighthouse destination, but I was able to discover California’s wild North Coast through the lens of their historical lighthouses. It provided a new perspective and appreciation for this part of California, and reminded me of the impressive scale and diversity of the state. Sherry Ott is a corporate American runaway traveling the world solo without a home since 2006. Read more about her adventures here: https://www.ottsworld.com/.